Keith and Brad leave early Saturday afternoon, after a storm has rolled through. Brad's in the passenger seat; you just can't see him for the reflection. First stop is still in San Diego county: getting gas in Carlsbad. Brad enjoys the responsibility on car trips of pumping the gas, whatever the make and model of car. 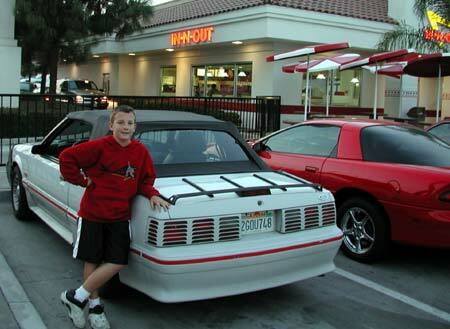 Note the irony of a similar-vintage Camero in the back ground also fueling up. How long is that driver going to hang embarrassingly on to his youth?. The first of several attempts to take pictures of road side attractions from the speeding car. Results vary. 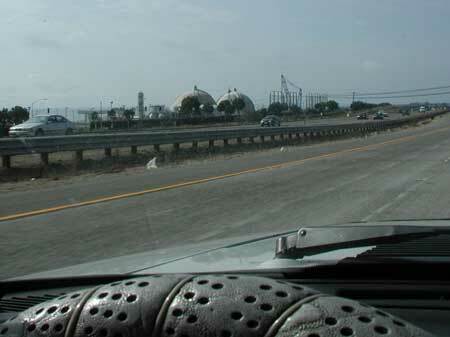 They are generally better when taken by the passenger, rather than the driver, like this shot of the San Onofre nuclear power plant just north of Camp Pendleton. 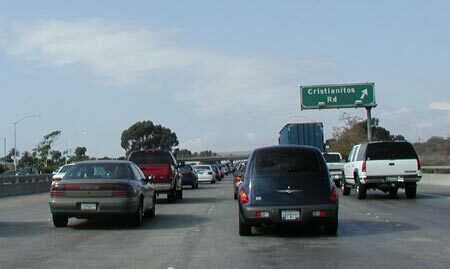 Our very first traffic snarl occurs at the very first exit into Orange County. Bradley, we aren't in San Diego any more. One of the little surprises I knew about our route was that it would take us right by Edison field, where a mere two hours later they would begin to play game 6 of the World Series. 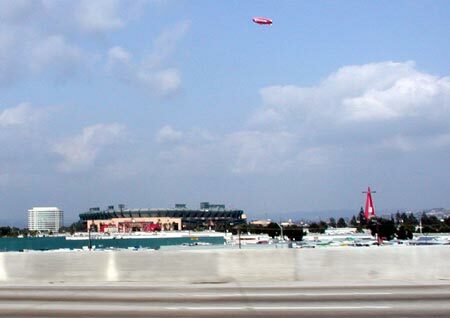 It was on Brad's side, and he got a great shot of the stadium, the big A, and a blimp. Bradley, a big fan of Chicago, very much wanted to see downtown LA. 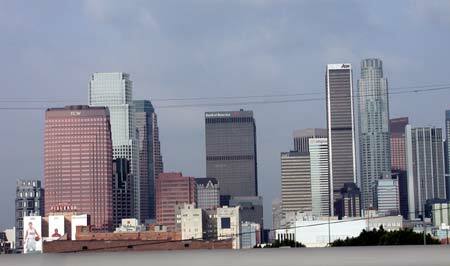 So we took a bit of a detour off of Interstate 5 (while still staying on freeways) to peruse the skyline of LA. Brad didn't find it as enthralling as Chicago's. 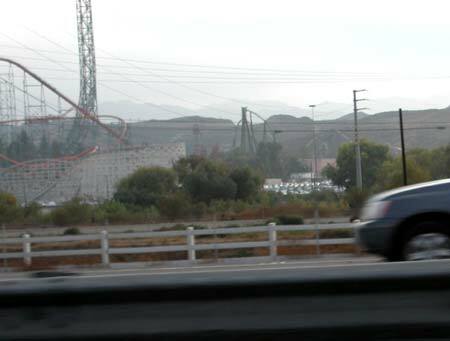 What happens when Keith attempts to drive and take pictures of Magic Mountain at the same time. We make it to Bakersfield for dinner and choose to dine at an In-n-Out drive through, appropriately enough. 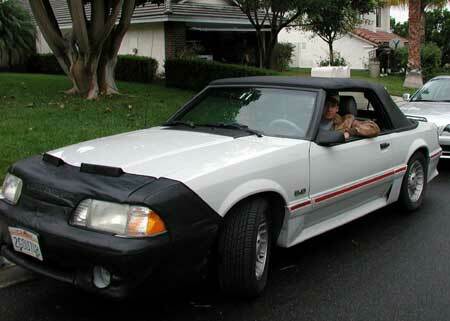 Darned if I discover when we get back and I "develop" the pictures that another Camero got in my Mustang picture. 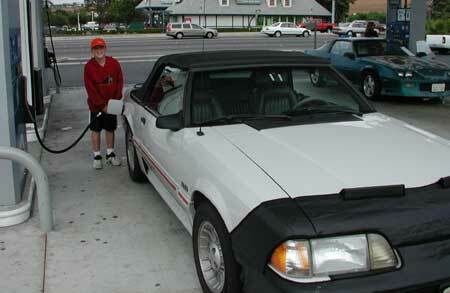 We did have the top down all through LA, but it got mighty cold on poor Brad over the Grapevine, so we put it up. He remained cold given I couldn't raise the driver's side windows.